The threat of climate change looms large, providing a unique set of challenges for the future, including how we will feed an estimated 9 billion people by 2030. One group of researchers in Brazil has proposed a different, stomach-churning solution. "They remind us of ches[t]nut or peanut. They're really good and tasty, and (their presence) does not affect the flavor of the bread," said Myrian Melado, a researcher at the Federal University of Rio Grande, as reported by AsiaOne. The roaches are bred in the lab and take approximately 75 days to mature before being harvested. Once harvested, they are pulverized and added to the bread mix. The practice of eating insects, known as entomophagy, has existed for millennia but has been largely overlooked in the western world since the agricultural revolution. However, as climate change continues to threaten the long-term viability of traditional livestock agriculture, scientists are once again turning to insects as a potential solution to world hunger both now and in the future. "Insects don't create waste. If we think of the amount of water we need to breed an insect, compared to the amount of it needed for cattle breeding, it's infinitely less," continued Melado. 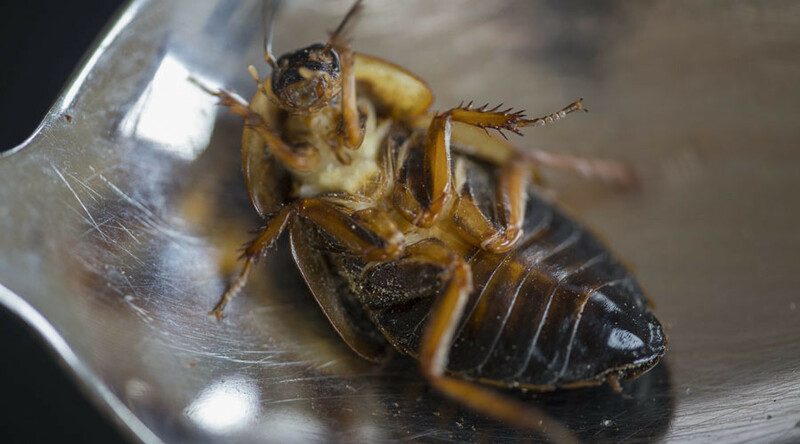 Scientists have long played with the idea of switching to insects to meet our protein requirements but, so far, the market in the West has resisted the allure of fresh mealworms that taste like pumpkin seeds or protein bars made of crickets. "On average, insects can convert 2kgs (4.4lb) of feed into 1kg of insect mass, whereas cattle require 8kg of feed to produce 1kg of body weight gain," according to a report by the UN’s Food and Agricultural Organization (FAO).